Accommodations available are in private bungalows and a dormitory. It should be noted, however, that the dormitory option is exclusively for women. Mandala Dormitory is a women-only dorm. It is located at the spot of Nirodha Yoga hall, so it is very convenient. It will take you 10 seconds to reach the yoga hall from your bed for your daily practice. The Fan Bungalow is a private bungalow within five minutes' bike ride to the training facility. It is very easy to rent a bike in Koh Phangan, and it costs around 6 USD a day. Features include a kitchen, terrace, and free WiFi. JB Easy Life Bungalow is within walking distance from the training facility also. Features include a terrace and free WiFi. Nirodha Yoga School is a Registered Yoga School with Yoga Alliance and the training follows the standards of Yoga Alliance. Upon successful completion of this training, you will qualify for RYT 200 certification. 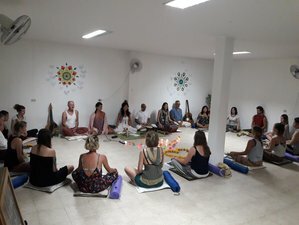 This 200-hour yoga teacher training on Koh Phangan covers all the necessary skills to get started on sharing your practical knowledge of yoga. In this month-long immersion, you will build a strong understanding of the physical, emotional, energetic, pranic, and spiritual layers of the yoga practice. You will learn about physical anatomy, asana alignment, therapeutic touch, and much more. Once a week, there will be a kirtan night. Kirtan is the chanting of Sanskrit mantras, accompanied with live music. This course is a comprehensive presentation of yoga as a vehicle to maintain and promote health, and a discipline which leads to genuine peace of mind. After a deep immersion into asanas, pranayama, bandhas, meditation, mantras, mudras, chakras, and the teaching of the ancient yoga scriptures like Hatha yoga Pradipkia, you will leave the course feeling confident and ready to teach. Yaron Cohen, Director & Lead Teacher of Nirodha Yoga, welcomes a international faculty of Yoga Teacher Trainers to Koh Phangan to share their own unique expertise including philosophy, anatomy, asana, meditation, teaching tools & methodology, and practical knowledge to develop your own practice & professional teaching. Each instructor who contributes to our programs has been offering enriching yoga classes & teacher trainings for over ten years. They teach from expertise, experience, and their personal connection to yoga. This transformational one-month immersion will allow you to make your mind and body a safe and stable home, to which the doors are always open. You will graduate with a solid foundation for lifelong yoga practice, as well as the confidence to offer effective, safe & meaningful yoga classes. Most importantly, you will cultivate self-knowledge, leading to a healthy relationship not only with yourself but the people and environment that surrounds you. Eva Hamilton is a Yoga Alliance certified RYT500 E-RYT200, Yoga Teacher with ten years teaching experience & over 1000 hours of formal training. Her teaching reflects her holistic background. Each class, she seeks a balance between the effort of asana & movement and the surrender of breath awareness, meditation, and relaxation. Her intention in teaching is to craft a supportive & nourishing energy, allowing students to connect with their own inner wisdom. Having previously owned a studio in Canada, Eva's yoga journey has brought her around the world to India, Mexico, France, USA & UK. Lorraine Lau, E-RYT 200, started teaching yoga professionally in 2005. She has taught over 4,500 classes at PURE Yoga HK in more than 5 years including Group, Privates, Corporate and charity classes. Lorraine was designated to lead a 10 episodes TV program teaching yoga poses representing PURE Yoga shown on East Asia Satellite TV Ltd. She believes balancing the yin & yang is important and passive stretching in Yin classes wins her heart in recent years. Yaron has been practicing yoga for 28 years, and teaching it for 15 years. He did an 18-month meditation retreat in Zen and Forest Buddhist monasteries in Japan and Thailand. He was healed from “incurable disease” (colitis) by the practice of meditation and scriptures-based yoga (for example: Hatha Yoga Pradipika). Therefore, it is his mission to teach and share his experience so those in need can heal their life. Yaron is a musician and practitioner of Bhakti yoga, the yoga of the love and devotion; he leads Kirtans and Bhajans regularly. Akari Tamura is an ERYT-200 hour Registered Yoga Teacher, known for her inspirational style of teaching and self-expression from the heart towards healing, love & empowerment. Since 2006 she has devoted years of study in traditional Hatha Yoga, Tantra Yoga, Tibetan Buddhism and Ashtanga Vinyasa Yoga. Akari invites students to stay connected with the flow of breath throughout the dynamic asana practice. She views the breath as a bridge between conscious and subconscious mind, a portal to the present moment, a key for healing and transformation, and a means to transcend beyond the physical. The teacher training course will take place in Koh Phangan, Thailand. Nirodha Yoga is located near Sri Thanu, which is known as a home of a big conscious community. It is a center of yoga, kirtan, ecstatic dance, tantra, and vegan restaurants. Healthy vegan brunch is included in the course price. For any other food needs, the school area is full of healthy food options, all within walking distance. Options include vegan and vegetarian, raw, and, of course, local Thai food restaurants. If you have special dietary requirements, it is a good idea to communicate with Nirodha Yoga when making a reservation. Please book your flight to arrive at Suvarnabhumi Airport (BKK) in Bangkok. From there, you may fly to Samui Airport (USM). Between Bangkok and Koh Samui, there are many daily services run by Bangkok Airways. Flying time is about 50 minutes. A connecting ferry will have to be taken from Koh Samui to Koh Phangan, for about 300 THB one way. From Bangkok, you can also fly first to Surat Thani Airport (URT). Air Asia flies from Bangkok to Surat Thani daily, flying time is about 50 minutes. The transfer from Surat Thani Airport (URT) to Donsak ferry port is by coach or taxi and takes about 90 minutes. At Donsak, you transfer to the Raja ferry to Koh Phangan, which takes three hours. While the overall journey is longer than flying directly to Koh Samui, it can be cheaper to fly via Surat Thani, depending on the time of year. There are many bus services from Bangkok to Koh Phangan. Most of these are sleeper buses. They can be booked from travel agencies in Bangkok or by going to the central bus station (Sia Thai). The journey takes about ten hours to Donsak, the ferry port for boats going to Koh Phangan. From Donsak, the journey takes around three hours to Koh Phangan. Usually, the ferry is included in the price of the bus. There are ferries from Samui To Koh Phangan. The Seatran ferry leaves Koh Samui at 8 a.m. and 1 p.m. The Lomprayah ferry leaves Koh Samui at 8 a.m., 11:15 a.m., 12:30 p.m., and 5 p.m. The Seatran pier is located near the airport, approximately a ten-minute drive and the Lompraya pier is located 50 minutes from the airport. The Lompraya pier is 50 minutes from the airport. Please take this into consideration when booking the rest of your journey. Ferries arrive in Koh Phangan at Thong Sala pier. For returning back, the Seatran ferry leaves Koh Phangan at 11 a.m. and 4:30 p.m. The Lomprayah ferry leaves Koh Phangan at 7:15 a.m., 11 a.m., 12 p.m., and 4:20 p.m.
From Koh Samui airport, there is a shuttle service going to the ferry ports for Koh Phangan. This is usually available as a free service. Please ask for this service when you purchase the ticket for the ferry in the Seatran or Lompraya ferry counter as you exit Samui Airport (USM). Trains leave Bangkok several times daily, the journey time is about 12 hours. Sleeping booths are available for some services. Leaving the train at Surat Thani, the transfer by coach or taxi from Surat Thani station to Donsak pier takes about one hour. From Donsak, the ferry journey takes three hours to Koh Phangan. There are two companies that run luxury coach services from Bangkok to Chumphon, which takes about six hours. At Chumphon, you transfer to a large express boat that stops at Koh Tao before arriving at Koh Phangan. The boat journey from Chumphon to Koh Phangan takes about three hours. Pickup taxis are only available from the pier. Please inform the taxi to go to Anahata Yoga Shala, Bovy Beach Srithanu. Taxis are approximately 200 THB per person. Nirodha Yoga offers yoga teacher training courses with a vision of bringing yoga's extraordinary health, spiritual, & psychological benefits to people in need.